Four years ago, Alexandra Brown left the world of traditional broadcast media to lead software company Aprilage. Now the company’s software is being used around the globe with very different applications. When Alex joined Aprilage, the company offered just one product, which was sold as a one-off to clients (mainly science centres). Alex’s goals were to diversify the product line, find new markets, enlarge the distribution network and listen to the marketplace. It’s safe to say she’s achieved them all in a relatively short time period. Focusing mainly in the health and wellness space, Aprilage creates, develops and distributes APRIL, visualization software for the face and body. APRIL is used by hundreds of clients in more than 25 countries in fields including health education, science, law enforcement and esthetics to link the effects of health and lifestyle on appearance. APRIL is used in over 30 major science centres around the world, and the company has provided the software to post-secondary institutions for free. At the University of San Diego, for example, a medical student is using the software to test ageism among medical students and the perception of medical personnel when dealing with the elderly. Aprilage is also used by police forces in a handful of countries, including the United States, Australia, Poland and Turkey. The software helps with missing children cases and with cases where people are unable to identify themselves (such as amnesia) or cannot communicate for one reason or another, enabling officers to more easily identify the person in front of them from photographs. Despite a presence in several different markets, Aprilage’s main vision is healthcare: helping people to live healthier lives and prevent chronic disease. The company’s predictive imaging software is used as a catalyst for discussions about chronic disease prevention and lifestyle behaviour modification. With the APRIL software, users can envision themselves in the future and better understand the connection between behaviour modification and health outcomes. The interesting thing about the software is that the results are completely data-driven, pulling information from a database of thousands of real people, ages 7 to 70, male and female, and from across five ethnic groups. The images were gathered at the Ontario Science Centre. Users can see the effects of their lifestyle on their health by adding or subtracting various factors, such as smoking, added body mass index (obesity) and heavy sun exposure. The only data you need to upload is your gender, age and ethnic group, and then the software ages you based on your demographic and whether you overlay sun exposure, smoking, etc. 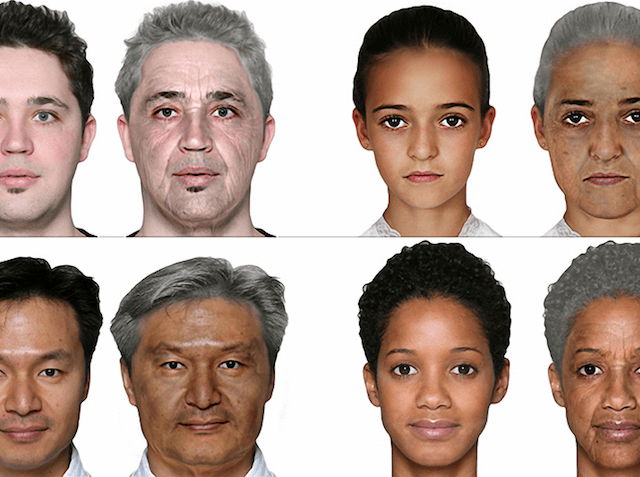 The statistical, database-driven “compare-and-contrast” results are based on how real people age, rather than a graphic representation of how people age. “That’s what gives the software its pedigree,” says Alex. You can watch demonstrations of the software here. “It certainly garners reactions—especially in an environment facilitated by a healthcare provider. They discuss things like diabetes, lung disease, heart and stroke… Now insurance companies are looking for ways to propel behaviour modification,” she explains. The software also helps in smoking cessation. Kiosks were set up in Australian pharmacies to see if the software would help achieve a higher percentage of people who quit smoking. The quit rate was verified and 13% of those smokers who saw themselves age quit smoking after a six-month period, whereas only 1.3% of those who had not seen themselves age quit smoking in the same period. Alex and her team will be doing some travelling this year, most notably to Dublin, Ireland, as Aprilage has been invited by IBM to attend the HealthXL Global Gathering on May 30. Attendees at the event will come from all over the globe, providing a unique opportunity for the leaders of digital health innovation to connect and collaborate. While there, the Aprilage team has been asked to demo the obesity module of the APRIL software at Science Gallery. There is plenty to keep Alex and her team of seven full-time employees occupied in the coming weeks and months. In addition to attending conferences to keep a pulse on what’s new, the team is also working on launching a platform-agnostic mobile app. Stay tuned!